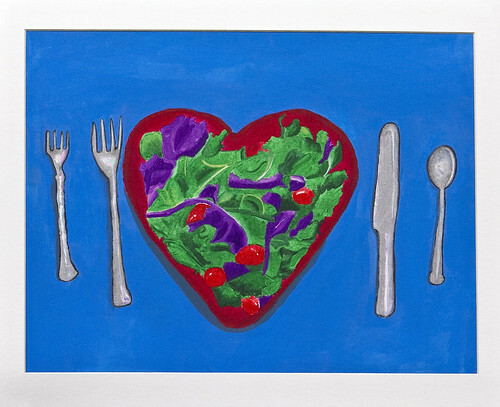 When you hear that foods are ‘heart healthy’ what comes to mind? Perhaps descriptors such as bland, fat-free, diet, or just plain old gross? As a registered dietitian I hear that a lot. People are either intimidated by the order to cook foods in a more heart-healthy manner, or they are rather turned off by the idea entirely because they ‘know’ it just won’t taste good. I promise you, it does not have to be that way. Yes, heart healthy cooking does require using less salt (notice I said LESS, not no more salt ever) and limiting fat in the saturated (fatty meat or full fat cheese) and trans (fried foods and baked goods) fats departments. But eating for a healthy heart also means adding more foods to your diet. To boost your heart health there are certain nutrients (e.g. healthy fats and antioxidants) that now play a positive role in promoting heart health and therefore we want to incorporate them into our daily food choices. Vegetables: Truly fruits and veggies, whether fresh, frozen, or canned (no salt added) always make an amazing addition to your day. The more the merrier, though please aim to include at least one fruit and/or vegetable every time you sit down for a meal or snack. Whole grains: Whether you kick-start your day with a heart bowl of overnight oats or choose to build your sandwich between two slices of wholesome whole grain bread, you are doing your heart a favor. In comparison with refined white grains, whole grains come with their complete nutrition package intact – meaning you are serving up healthy fats and fiber, both of which lead to healthy cholesterol levels. Fat-free or low-fat dairy: Cow’s milk, goat’s milk, almond, or soy, whichever the source, make sure your dairy is low in saturated fats and loaded with at least 30% calcium and hopefully some vitamin D as well. And when it comes to flavored milk, moderation is key. There are several flavored plant-based options, whether very vanilla or dark chocolate, which pack in 3-4 teaspoons of added sugar per one-cup – that’s more than half of the amount women should have in the entire day! Lean proteins: When you are in the meat aisle, be picky. Opt for extra lean ground beef, lean ground turkey breast, skinless chicken breast, turkey breast, or cuts with the words ‘loin’ or ‘round’ in them for a healthier pick. Doing so will help you trim the amount of cholesterol and inflammation raising saturated fats. Of course, meat and poultry are not the only sources of lean protein by any means. Fish, beans, nuts, seeds, and even soy provide excellent sources of protein without the unhealthy fats included – AND they come with heart healthy fats and fiber, making them best picks in my mind. Wow, okay. Enough with the ‘eat this, not that’ mentality. Let’s go ahead and focus on the good tasting food. Here are five of my go-to recipes that are perfect for adding a little extra boost to your heart and joy to your taste buds. Peanut Butter Oatmeal. Cholesterol lowering soluble fiber? Check. Heart healthy fats? Check. This duo is a win-win, plus the peanut butter transforms the sometimes off-putting texture of oatmeal making it palatable to even the most oatmeal averse. Cauliflower Risotto. Swap white Arborio rice for this cruciferous veggie and your heart will be jumping for you. I have a feeling your taste buds may also jump in. This recipe was a big hit in one of our holiday cooking classes. Roasted Chicken Breasts with a Raspberry Balsamic Glaze. This meal is sure to be a crowd pleaser and pairs beautifully with the cauliflower risotto above. You can opt for the sugar-free jam if you are truly limiting your added sugars, or go for a natural jam, whatever works for you. Dark Chocolate Avocado Pudding. Swap this dessert for a ‘snack pack’ and you will surely do yourself a favor. When you are in charge of the recipe, you decide what ingredients are added and in this case it’s merely avocado, cocoa powder, and honey. Make your own Ice Cream. Swap a serving of full-fat ice cream for banana ice cream and you will quickly slash 2-0 grams of fat and nearly 20 teaspoons of added sugars, while still providing one heck of a flavor (and texture) pop. Don’t knock it until you try it. The best part about all of these recipes is that even though they are all heart healthy, they all sound delicious. Making conscious decisions about your diet to improve heart health doesn’t mean you can’t enjoy what you are eating. Small changes here or there can really help to improve your heart health. Jessica Corwin, MPH, RDN, is a community nutrition educator at Spectrum Health. She graduated from Western Michigan University with a Bachelor of Science in Dietetics before moving on to Michigan State University to complete her dietetic internship. She spent five years working in school nutrition with a large foodservice distributor, before returning to MSU to attain her Master’s in Public Health. This move allowed Jessica to transition from a career in corporate dietetics to one out in the community teaching people how to eat right in practical ways through cooking classes and nutrition education, both in the kitchen and at the farmer’s market. She also serves as the nutrition consultant for “Yum Food and Fun for Kids,” a family focused healthy eating magazine, and writes for several other small national syndications. When she is not in the kitchen, she can usually be found hiking with her handsome husband and adorable son.